Summer may be waning but don’t try telling the members of Tape Stacks the news as they can easily counter this information with their brand new EP titled Six Rooms, out independently this week. This charming release is a shimmery time capsule filled with tunes about sunshine, thunderstorms, wanderlust, romance, and heartache. All things associated with the season, which means the EP is just what the doctor ordered for any type of weather related disorder. Six Rooms opens with the breezy little number, “Sun Breathing,” perfect for cruising the California 1 in a convertible on a beautiful day with the top down. Followed by the day-dreamy, “Counting Mountains,” a song about laboring through the daily 9-5 grind in order to make it to the adventures the weekend brings, and you have yourself two perfectly crafted traveling tunes. “Thunder Room” is a delightful shoegazer reminiscent of early Lush, while “Cowboy”, “Heart in Half,” and “Split End” each examine the complexity of relationships and the positivity that can be found traveling through life together despite the less than positive outcome. The Seattle-based 4-piece, Kara McPhillips (guitar/vocals), Josh Buser (bass), Layton Hayes (keys), and Mandy Hubbard (drums/vocals), formed in 2012 and have been infiltrating the area’s music scene one legendary venue at a time. They had already graced the stages of The Crocodile, Tractor Tavern, and The Sunset before the release of the first EP, and are now focused on spreading their jangly, indie-pop goodness beyond the Pacific Northwest with their latest effort. Tape Stacks record release show takes place Friday, August 21st at Conor Byrne in Seattle. Here’s to hoping they find their way to the East Coast this year. After all winter is coming, and we will need their summery vibe to survive the long, cold months. 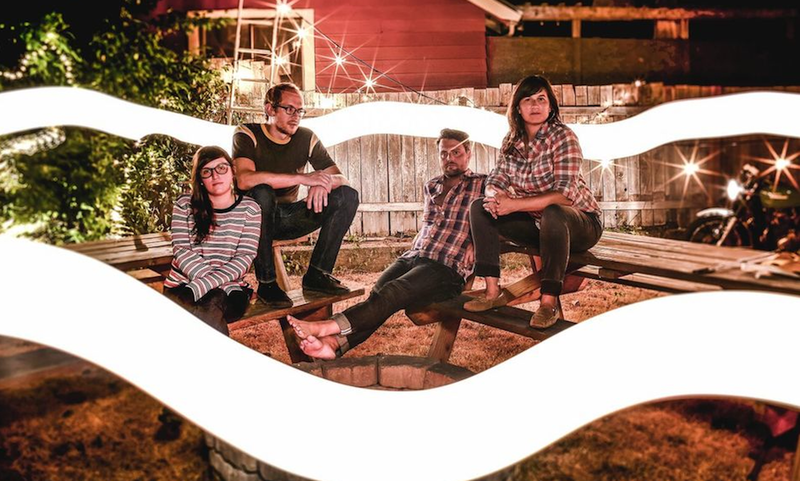 Seattle’s @TapeStacks have a summery new EP out called “Six Rooms” Check out my @musicsavage review here http://t.co/e8vDr8XzCm Great stuff! Mike Mates liked this on Facebook.